Where Will Barrick Gold Be in 10 Years? So long as it's learned its lesson, we could be looking at not just the world's biggest gold miner, but in all the universe. When all the world was crashing down around the commodities market, bankruptcy was being priced into the future of the world's biggest gold miner, Barrick Gold (NYSE: ABX). Having embarked on a decade's worth of massive acquisitions, it was saddled with debt, rising expenses, and falling prices. Its stock price cratered to just $6 per share, and the potential for defaulting on its debt seemed great. Yet Barrick Gold is one of the best in the business, and its all-in sustaining costs of less than $800 per ounce is among the lowest giving it special ability to generate high cash margins. It may have reacted slowly and late to the crisis, but a serious cost-cutting program has allowed it to recover with its stock doubling in value this year. The worst seems to be behind it, so we've asked three of our contributors where they expect Barrick Gold to be tens years from now. Clearly, the strategy of growing for the sake of growth did not pay off. That's why Barrick Gold is shifting its focus away from expanding gold output and instead focusing on increasing its free cash flow on a per share basis. To achieve that aim, the company plans to concentrate on three things: owning the best gold assets, operating at the lowest possible costs, and effectively becoming debt free. In doing so, the company will be agnostic on the price of gold, allowing it can generate substantial cash flow in any environment. This plan suggests that the Barrick Gold of tomorrow will be a much leaner company that's focused on creating lasting shareholder value. Further, given its free cash flow focus and plans for a pristine balance sheet, Barrick has the potential to be an outstanding dividend stock. Rich Duprey: Willy-nilly growth is fine when the market is bullish, but a company has to be ready for when the lean times come, too. But Barrick Gold acted as though the good times would never end, and as Matt shows, it hit the miner hard when the cycle reversed. Like many of its peers, Barrick was forced to sell off non-core assets to rein in expenses, but the downturn created a situation that was once unthinkable: also selling off core assets. Others in the industry are now doing it, too, showing just how poorly gold miners planned for the future, but Barrick Gold is considering the sale of its biggest asset, the massive -- but stalled -- Pascua-Lama gold mine in the Andes mountains. Straddling both Argentina and Chile, Pascua-Lama is estimated to have 15.4 million ounces of gold reserves and more than 674 million ounces of contained silver. But the $8.5 billion project has run afoul of environmental concerns and worries of the local indigenous peoples, and sits in mothballs, making it uneconomical to carry. Barrick is also considering selling Veladero, one of the richest gold mines in Argentina, and indeed all the world, but whose operations have been temporarily suspended, also due to environmental issues. Despite this, Barrick just increased production guidance for 2016 due to stronger projected production from its Goldstrike and Cortez mines, both of which are now expected to produce over 1 million ounces each. What this shows is that Barrick Gold has an embarrassment of riches, a portfolio as deep as it is wide so that even selling off potentially lucrative projects doesn't undermine this miner appreciably. And though forecasting gold's price a decade into the future with any certainty is impossible, it's certainly easy to think gold will trade at prices much higher than where they are today. Barrick Gold still possesses world-class assets, is the premier miner in the industry, and has undertaken a program to cut costs, reduce debt, and focus on its core strengths. It's safe to say that when looking at the miner's stock price and the value it offers despite its rebound this year, an investor would be hard-pressed to find a precious metals investment that still has as much potential. Rich Smith: I'm going to throw you all a curveball here -- a real "black swan" event, but one that if you squint hard enough -- you may just be able to make out crossing the horizon: asteroid mining. If you're going to talk about where Barrick Gold will be not next week, next month, or next year -- but 10 years out -- then I think you need to consider the remote possibility that Barrick, and indeed, any company that has tied its fortune to digging up rare rocks from the Earth's crust, could become undone by the discovery that these rocks aren't so rare -- in space. Image source: Deep Space Industries. Sometime in the next decade, NASA intends to send its new Space Launch System out to capture an asteroid and haul it back into lunar orbit to see what it's made of. In the even nearer term, private companies such as Deep Space Industries and Planetary Resources plan to send space ships out to capture their own asteroids, and begin mining them for elements that are rare on Earth, or expensive to send up into space. This could include such mundane things as water (for fuel) and oxygen (for breathing) -- but also gold, silver, platinum, and other mineral resources that produce a lot of profit back here on Earth. Planetary Resources launched its first spaceship (an observatory) just last year. Deep Space Industries will send a test vessel up next year, and hopes to begin mining operations in three years. Meanwhile, companies that are even farther along in the process, such as Moon Express, will begin similar operations on Earth's most famous satellite in 2017. 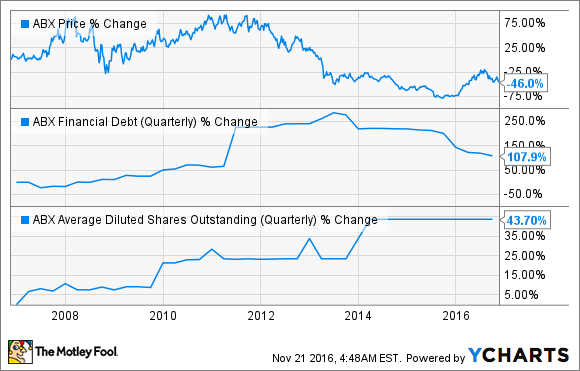 Now, what does all of this mean for Barrick Gold? I'm honestly not sure. Could be they'll become a financier of such galactic mining projects. Could be they'll form a space division of their own. Or could be they'll get caught unawares as other companies begin prospecting for gold nuggets among the stars, while Barrick is still busy scavenging for gold dust down here on Earth. That's the thing about black swans. They're uncertain -- and you need to be prepared for all possibilities.